Following on from the previous episode, this week we look at creating camera profiles for Capture One Pro using a product called Lumariver Profile Designer. This is a video again, so the audio player is basically redundant, but I’ll include it anyway. I’ll leave my notes below, for those that prefer to read, but this really is an episode that requires you to watch the video to not only understand how to create these camera profiles but also to be able to see the benefits when applying the profiles to images in Capture One Pro. Here’s the video. Here are the notes I made as I prepared for this episode. The Lumariver manual states that exposure should be around 220 on the white patches, and I have a photo of the Digital ColorChecker SG from last year that is around 221 on the white patches, so that’s perfect! This image was exposed so that the white patches were not blinking, but 1/3 of a stop brighter would have made them blink on the camera’s LCD. We first use the White Balance picker to set the white balance using one of the mid-gray patches and note that the image is pretty much a perfect 5000K white balance. Nice! Then we need to go to the Base Characteristics panel, and under ICC Profile select Effects > No color correction, and also set the Curve to Linear Response. We then export the file as a 16 bit TIFF with the ICC Profile set to Embed camera profile, then export a second TIFF with the Curve set to the setting we usually use, so I’ll go with Auto. Next select New Project from the Edit menu in Lumariver Profile Designer and select “General-purpose ICC profile”. You can use Lumariver to create DNG profiles for use in Lightroom and Adobe Camera Raw, but our objective is to create a camera profile for Capture One Pro, my raw processing software of choice, so we need to select ICC profile. We then click the Load Image button and load our linear curve TIFF file, and then select the Illuminant that is closest to the light source that we photographed the target in. My custom white balance showed me a reading around 5000K so D50 is smack on. Then select the type of target used, which in this case is the X-Rite ColorChecker SG. Press the Show Target Grid button and align the corners of the grid that is displayed with the registration marks on the ColorChecker target, then turn on the Grid is in place checkbox. Click on the Tone Curve label towards the bottom of the right sidebar in Lumariver, press the Load Base Curve button and select the second TIFF that we exported with the Auto Curve applied. The next option, Curve Mode is actually key to making Camera Profiles for Capture One Pro that work without having to brighten your images up again after applying the profile. You need to set the Curve Mode to Add to Base Curve. The default setting of Replace Base Curve gives you a dark profile. On this screen let’s also load the curve from the Capture One Pro load the ICC profile from Capture One. Under the Look section, I changed the Tone Reproduction Operator to Neutral, as opposed to Skin&Sky, as I don’t really want anything changing. I also changed the Gamut Compression to None. Gamut Compression basically compresses the colors into a smaller working color space, like sRGB or AdobeRGB, but as I keep my images in ProPhotoRGB for as long as possible, and because I know that the camera is working in a much wider color space, I don’t want to limit them falsely with the profiles I’m creating. It’s great to have these options! Finally, under the ICC Export section, I turned on High-Resolution LUT, because I can, and we’re now ready to press the Render button. Wow! Right there I like what I see very much. We can now export the ICC profile. The default Profile folder that was selected was for me only. So that I can access this profile from other users, should I create any, I changed this to the /Library/ColorSync/Profiles folder, and called my new profile “CanonEOS5DSR-MBP Generic”. I used this naming convention so that Capture One Pro would list my profile alongside the other CanonEOS5DSR profiles. I also created a second profile with a 3D LUT (Look Up Table) selected under the Optimization section. The manual says that this is really for Reproduction profiles, but being me, I always want to try to use the best possible options, and 3D LUT profiles apply the corrections differently according to the brightness of the color. Although the manual warns that 3D LUT profiles should only be used on images shot under the same conditions, my tests have shown that these work great as a Generic ICC profile for my Canon 5Ds R.
Note that I needed to leave Scale to Match off when creating a 3D LUT profile, as turning this on made my images too bright, unless I used the Linear Response Curve, and then actually the images looked OK, although a little flat. Then if it was open we need to restart Capture One Pro so that it can find the new ICC profiles, and all we need to do is select the new profile under ICC Profile in the Base Characteristics section, and WOW! Just watch those colors pop! If you want to really bring out the most from your camera, I think we’ve just found the way to do it! I honestly didn’t think it was possible to improve the image quality of Capture One Pro, so this is a pleasant surprise. I am going to be applying this new profile from now on, and will also go on to create some other profiles for my studio lighting etc. I think a couple of profiles will probably be enough to cover most of the work I do. Although the process to create a profile is a little more complex with more steps, once you have saved a project, creating future profiles is a piece of cake, and the look of the images with these profiles is great! All importantly, the price is very reasonable. The Pro version is said to be enough for photographers, at €100, but for a little extra control and options, the Repro version will set you back €200. This product now has a place in my Capture One Pro workflow. It’s not that I was unhappy with the color of my images, but I do often tweak it, and these profiles get me closer to where I want to be, and that will be a huge time saver. I just wish I’d found this software sooner! You can try Lumariver without a license, but you can’t save the project or profiles without a license. That’s still useful, as you can see your photographs after rendering them, to ensure at least that you have the process down before you buy. So lets say I take a photo that shows in camera white balance as 6000k even though my profile was done with the same strobe and softbox and white was measured as 5200 from the Colorchecker patch. Do you adjust the White Balance to 5200 for the photo then or leave it as the camera determined with the AWB? I am guessing you move it to what you measured when doing the profile or adjust to meet my preference. But would like to hear your opinion. Sorry for the late reply. I’ve just got back from Namibia. In this situation, you would definitely adjust to the white balance measured from the ColorChecker Patch. That will be more accurate than the camera’s AWB. I use Capture One and Colorchecker Passport for doing my profiles in LumaRiver. Is it a good idear to set WB manualy in camera to correspond with the scene ( example 5200K for a flash photo), and then later check and perhaps adjust it ( to 5200 ) using Color Picker in Capture One’s White Balance Tools before making the Low and the Curve files ? Until a few years ago, I’d have said yes, without hesitation, but Auto White Balance is now so good that I think you’d be fine to use an automatically set White Balance, then adjust to the accurate White Balance using the Color Picker as you mentioned. It won’t hurt at all to set it manually before you shoot the target, but I personally don’t think it’s necessary for regular lighting. If you were working in very strange lighting that confuses the camera’s AWB, then I’d be more likely to try to set it manually. Awesome, made me buy it and I love it. Using CaptureOne here and Lumariver. Thanks. That’s great Aleksander. I’m pleased you found this useful. Great video. Made me bought a license. But I have a question: in your video, you measure the white patch and make the white balance on a non linear image. Make sure the target is well-exposed. As a rough guide the white patch should end up around value 220 (with the linear curve) inside Capture One. I think I mentioned that difference at some point, but if I recall, when you follow the manual and do what they say, you end up with a profile that is too bright and requires a lot of messing around to actually bring your image back to something pleasing, and that is too much work for me. Plus it just feels wrong, as though I’m causing myself to have to rescue the image. If you have the software now, try it for yourself in both methods and compare your results, but in my own tests, I had to use the settings that I specified. I made new tests and the profile made following your suggestion is more balanced. As in your examples, I could also see a shift in the reds between the normal ICC profile and the 3D reproduction one, the latter being nearer to reality..
Will now make further profiles for different lens combinations. Remember to set Curve mode to ADD to Base Curve or else you new camera profile will be too bright. With this workflow my new camera profile is perfect. I do everything that you say, except the Linear response curve, but I wonder, do you Load a Custom Curve for your camera from Capture One Pro, as I mention at around 7 minutes into the video? If not, that could be the reason you are getting good results with a linear curve. If you did, I wonder why there’s a difference in our findings. Personally, I tried it according to the Manual and it didn’t work well for me, which is why I am showing the method that I settled on. Martin! I just found your review and I have the following question. I träbro follow your instructions and the profiles come out OK except that they are quite a bit darker, in spite of the fact that I use “add” and not replace. What I find strange is that, when I watch your video and see the color differences between the various profiles, you seem to use Auto curves. When I do that I see no difference between the profiles, including the generic one. I have to use a linear curve for the difference to show up. Am I correct or are you using linear curve also. Yes…I load the default camera profile from CP1 Color Profile/camera.under Tone Curve and Drop Custom Curve……and then use Add to Base Curve in Curve Mode…..this is important or else you get a profile that is not good. I know this is important. That’s why I followed these steps in my video above. I’m trying to figure out why you get a good profile following the manual when I could not. I folllow the manual…so it’s a good questing why it works for me ? I have made a profile for Daylight/Speedlight ( 5000K ) and one for Incandecent light ( 2850k ) and these profiles ar better than CP1’s default profiles. If you follow this thread back to Olivier’s question, that you also answered, you’ll see that Olivier was questioning why I showed something different to what the manual says, and I explained in my reply that when I follow the manual I do not get pleasing results. You are saying that you do get good results, so I’m wondering why. That’s all. I apologize if you feel that i am attacking you….that was and is not my intention ! I have always got very good respons from you ! I used a correct exposed picture mesuring 226 with settings ICC: No color Correction and Curve: Film Standard V2 ( NIkon D3S) and then exported it as pict_curve.tiff. Then I have change Curve to Linear Response and exported it as pict_linear.tiff. I have then make a profile in LumaRiver with these to files and my camera specific curve in Custom Curve and Add to base curve….just as your video explained. I can’t see any difference to the profile I have made earlier make on the LumaRiver manual when I’am comparing these two profiles ? Not at all. I’m just having a hard time figuring out what your point is if you were not simply telling me that for you, this process works according to the manual. But, from the process that you wrote above, it looks like you are doing exactly what I explained in the video, so I’m still a little confused, but not to worry. I have tried following the video again and again and I can’t figure out where I might failed. By the way….when I was reading the manual from LumaRiver again I fell over this “Lumariver Profile Designer’s profiles will never exceed the ProPhoto color space.”. I normaly use ProPhoto Colorspace in my workflow in CP1 and later in Photoshow if further adjustments is necessary..
Do you know if my new cameraprofiles maked in LumaRiver therefore will decrease the colorspace in my pictures ? If you haven’t seen this, take a look at this video, especially shortly after 5:30 when I show just how large the ProPhoto Color space is. If Lumariver is using ProPhoto RGB we don’t have anything to worry about. I see you are talking about Gamut Compression at about 7:40……..I think it is this you mean ? •ProPhoto — ProPhotoRGB color space, use gamma 1.8 if you want its traditional gamma. Lumariver Profile Designer’s profiles will never exceed the ProPhoto color space. I’m now in an airport with flaky WIFI so I can’t check, but are you referencing the LumaRiver video? I linked to a video that shows how wide the ProPhoto color space is. The Lumariver Profile never exceeding the huge ProPhoto workspace is not a problem, I assure you. Until I discovered Martin’s video, I was working with Christophe Metairie from CMP Color (http://www.cmp-color.fr/). To compare them, I focused on the wood door rendering and the color of the sky. What I noticed is the difference of luminance on the wood door between the user guide way and the Martin’s way. As we use the Auto curve, it could be possible that it adds a bit too much lightness which is corrected if you choose to measure the patch after adding the Auto curve. What I also notice is the differences of hue in the reds and in the blues (sky). Capture One Generic, CMP and LumaRiver 3D are more reddish and turquoise where user guide and Martin’s way are more orange and more realistic blue. I wasn’t able to recreate the quality of CMP’s profile but the 3D one is really close. What Christophe states is that default profiles from Adobe, Phase One, DxO have tendencies to crush the highlights, that is maybe the reason why the 3D profile is closer to his profile. Sorry for my very delayed reply here. I was busy or traveling when you first posted this, and figured I needed more time to take a look and then forgot about it. I’d say that your investigation is spot on. I have found that my ICC profile, especially the 3D version, can be a little bit on the bright side. I always expose to the right in the field, but then when I import my images and use the Lumariver profile, sometimes the images are a little overexposed, and I have to pull them down a little. If I switch back to the Capture One Pro default ICC profile, the images are not over-exposed, so it’s definitely due to the profile. I’d really like to create a profile somewhere between what I get by following the instructions, i.e. too dark, and my current profiles, which are a tad too bright. I’ll revisit this as time allows and report back if I find anything new to add to the conversation. And I can see the very little difference i luminosity in the door between userguide way and Martin’s way ( picture 3 and 4 )….but I can’t see any difference in values and curves in CP1’s panels ?. Yes….it is your LumaRiver video I am refering to……I can’t see the other link ? But I’m glad to hear you saying that there is no problem with ProPhoto colorspace and LumaRiver. I still seel the link above, so I’m not sure why you can’t see it. Now the link is working for me…thanks. Nice video, thank’s for this useful great job! I’m a french studio product photographer and I use 3 Tilt/Shift lenses with my Canon camera. I would like to know if I must create 1 ICC Profile for each lenses for studio with flash and 3 others ICC Profil for outdoor for architecture photos? And if so at what °K color (5500, 6400)? If I thake architecture pictures indoor with tungsten or Fluorescent Lamp lights should I make another profiles? You’re welcome, on the video etc. I’m pleased you’ve found this useful. I don’t think it’s necessary to create a different profile for each lens. The lens itself doesn’t affect the color enough to warrant this in my opinion. You would probably benefit from creating a different profile for light sources that differ as much as say daylight and tungsten or fluorescent lighting. I’ve been using the same profile for daylight, including cloudy, sunny etc. but for completely different light, it’s worth creating a different profile. With regards to the color temperature, I’ve been using the same profile for ranges between 4000 and 6500 and they all look fine, so there is quite a lot of leeway in a single profile. Thank’s for your quick answer, it helped me a lot! 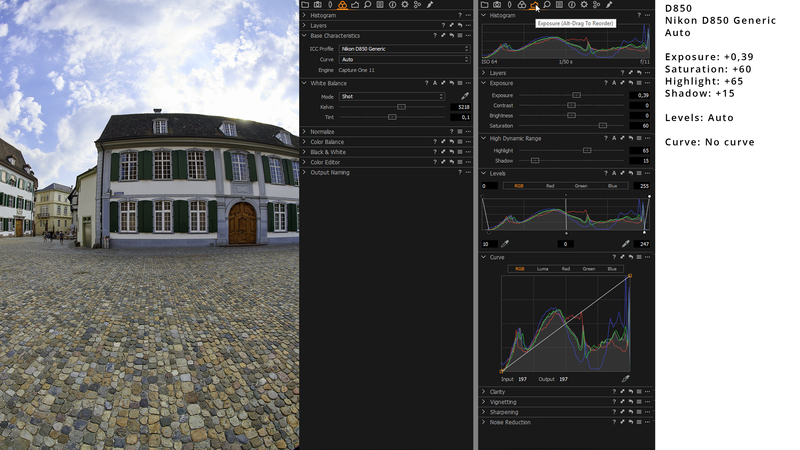 To create a 3D LUT (Look Up Table) what version of Lumariver are you using? Lumariver Profile Designer Pro Edition (100 Euros) or Lumariver Profile Designer Repro Edition (240 Euros)? In my studio the Flashs colors temperature are 5500°K (±100°K), in Lumariver why you choose Illuminant D50 5000°K instead of 5500°K? I’m using the Profile Designer Repro edition, but I believe the regular Pro Edition is all that you need to do this stuff. I use 5000 K because the majority of my images are closer to 5000 than 5500. If your flashes are 5500, then select that for your own profiles. Thanks. You have a nice day too! Thanks for stopping by, and I look forward to interacting again at some point. All the best with your photography!